Forehand and Backhand Welding Technique! And: Push Versus Pull MIG? To understand forehand and backhand welding you must for understand the basics of your Work angle. The work angle is basically the angle of your electrode or welding torch in relationship to the surface of the metal (the base metal as it's referred to) you are welding. See image below for what the work angle looks like on a groove and fillet weld. In terms of welding pipe, the work angle is where the center-line of your torch or the angle of your electrode is in reference to the pipes surface (or plane) in a plane which then extends out from the pipes center and then through your puddle. Side Bar: If you are interested in push versus pull mig welding technique and what's best I have a couple of short videos for you at the bottom of this page. The travel angle is also known as the drag or push angle. Technically it is the angle your electrode takes (or the centerline of your torch/gun) in reference to the line which is at a right angle to the welds axis and the weld axis plane. The image below shows you the travel angle. When you are push welding you are forehand welding. 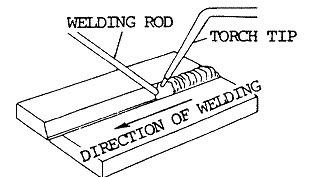 In push welding (or forehand welding) your rod , the welding rod comes before your torch. You will be holding your torch at an angle of about 30 degrees from a right angle or vertical as you weld. See image below. As you can see in the image below your flame will be pointing toward where you are welding and your flame is pointing right between your welding rod and the weld puddle. You will dip your welding rod into the puddles edge (the leading edge of it). When you do it this way you will put in the right amount of filler metal which melts and creates a nice weld joint. The welding rod keeps the metal molten because the heat is reflected back therefore the metal is uniformly spread to the edges which you are welding as a result of the motion of welding torch tip and welding rod. Torch and rod angels are 45 degrees as viewed by the operator and perpendicular (90 degrees) to the work surface as viewed from the end of the workpiece. Push welding is a good way to welding sheet metal or plate in most if not all welding positions. However you will find it difficult to weld thicker metal because when you are push welding you must have the edges of your metal plate beveled so that you achieve a V shape that is adequately wide and an angle of 90 degrees. The reason you want to bevel the edges is because it will help the edges of your piece melt and provide good penetration. It will insure fusion of your metals. Since you are creating a V shape that is wide you will also need a weld puddle that is large enough. But you will find it challenging to create a quality joint with a large puddle. Backhand welding is also referred to as pull welding. It's also the drag angle. 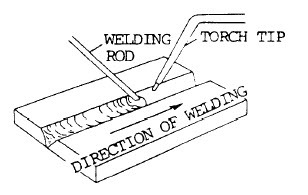 Put simply the angle of drag is where your welding rod is pointing in the opposite direction are welding but the torch is at about a 30 degree angle give or toward the direction you are welding. When you are backhand or pull welding the torch comes before the rod. See Image Below. As you can see the welding gun or torch is being held at about a 30 degree angle. It's pointing in the opposite direction of your welding but the flame or tip is pointing at the weld puddle. You'll find that this method of welding does not require as much sliding, or transverse motion, compared to the push welding technique. You will also find that the pull technique is best for heavier materials that allow for a smaller weld joint V shape. To achieve a quality weld a beveled edge of about 60 degrees should be OK.
Backhand welding also produces less puddle and you will therefore use less rod in comparison to forehand welding. Torch and rod angles are as viewed by the operator and perpendicular (90 degrees) to the work surface as viewed from the end of the work piece. Push Versus Pull MIG Welding? Watch these videos for a clear understanding of push versus pull MIG welding and put an end to the debate (if you have been welding for some time you know that there has been an endless parade of debate over these two MIG techniques and many welders are simply fed up with the whole thing).